The user and the employer explicitly permit the company Adittec, kadrovske rešitve, d. o. o. (hereinafter referred to as: Adittec) to collect and process data in accordance with the data protection policy to ensure the website’s services. The collected data will be used by Adittec to perform the services that it offers and provide you with a positive experience in the operation and use of the website. Adittec respects the privacy of your data (your privacy) and it will do anything necessary to protect them against any violation or abuse. The data that you provide on the Adittec website, will be used solely for the purposes of sending requested information or for forwarding your personal data to potential employers for the purposes of job seeking. Adittec will not abuse your personal data, they will not send you unwanted commercial e-mails, or violate your privacy in any other way. Without your authorization, Adittec will under no circumstances use, forward or share with third parties or institutions your data, except when required by law. Your data will therefore always be used for the purposes in accordance with the law and not for the purposes that might harm you in any way. Occasionally and according to the law, Adittec sends notifications on users’ e-mails regarding news and services which are related to job seeking and are useful and interesting to users. In each sent message, the user has the possibility to unsubscribe from further similar messages. Your personal data will be saved and used only for the period necessary for the attainment of the purpose for which they were collected and processed. After the purpose for which your data was collected and processed is completed, your personal data will be erased, destroyed, blocked, or anonymized, with the exception of data that might be defined as archive material by the act that regulates such material. Your personal data submitted when registering or later may be verified at any time, changed additionally or deleted by submitting a request to the following e-mail: info@adittec.si. block or delete personal data upon the request of the user. 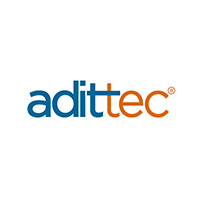 Adittec may for any reason occasionally change, complete, or improve the notice on data protection published on their website, whereby all the changes apply to all the users upon their publication. The user consents to the transfer of personal data to employers inside and outside the EU and is informed that third countries may not ensure the same level of data protection as the Republic of Slovenia. If you have any questions regarding your personal data or you would like further information, you can contact us at info@adittec.si.